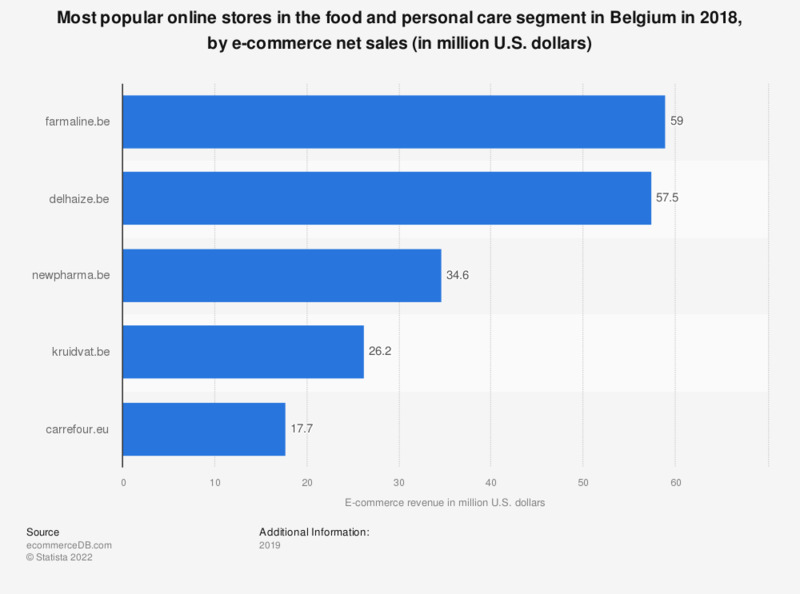 This statistic presents a ranking of the most popular online stores in Belgium in the food and personal care segment in 2018, sorted by annual net e-commerce sales. In 2018, market leader farmaline.be generated 59 million U.S. dollars via the sale of products from the foor and personal care segment in Belgium. The online store delhaize.be was ranked second with a revenue of 47,2 million U.S. dollars. The e-commerce market category “Food & Personal Care” contains the online trade of food and beverages (excluding baby food), as well as medicine, cosmetics, and pharmaceutical and personal care products (inclusive of prescription drugs for the private end user (B2C)). The market category also includes medical products for private use (e.g. blood pressure monitors, disinfectants, dressings).